The cards on this CD date from 1908 to the 1954. This CD has quite a few of the old post card type cards, several of which are Happy New Year post cards. 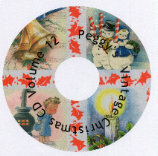 This CD is totally devoted to Christmas and contains the scans from 151 cards. This CD has 337 files that are comprised of 240 images and 143 verses to clone, print and/or copy and paste.